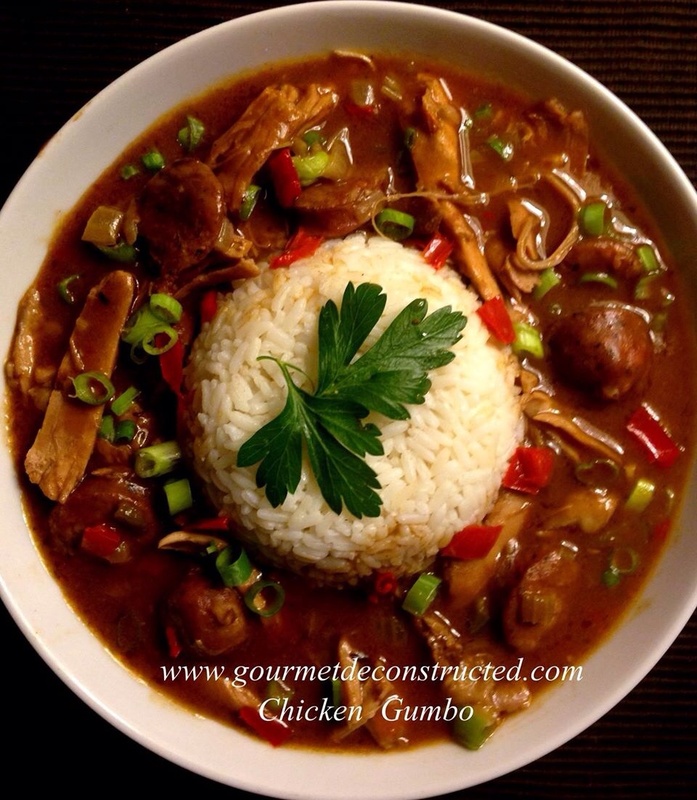 A wonderful and authentic gumbo recipe ” Str8 Outta The Bayou”! Combine the chicken, carrots, fresh thyme, halved celery, quartered onion, peppercorns, and 2 bay leaves with 10-12 cups of water into a 10 quart stockpot and bring to a boil. Reduce heat to medium-low and simmer until chicken is cooked through; about 35-45 minutes. Remove the chicken, allow it to cool then discard the skin and shred the meat from it. Strain the stock and set it aside. Heat the butter in an 8 qt saucepan over medium high heat and whisk in the the flour. Continue constant whisking until you have a dark brown roux. Add bell peppers, chopped onion, chopped celery, bay leaf, garlic, salt, and pepper. Cook until onions become soft then add Creole seasoning, cayenne, dried thyme, red pepper flakes, salt, pepper, and andouille sausage; cook until fat begins to render from the sausage, about 5 minutes. Add 6-7 cups of the reserved stock and bring to a boil. Reduce heat to medium and cook (frequently stirring) until it thickens 10-15 minutes. Add chicken and shrimp then cook 10 more minutes until hot and remove from the heat and stir in the File powder. Serve in a bowl with white rice and garnish with scallions. Bon Appetit! Posted on November 7, 2014, in Poultry and tagged Andouille sausage, cajun, Cajun-Style, cayenne pepper, chicken, chili pepper, creole, creole seasoning, gumbo. Bookmark the permalink. 4 Comments. I can say from experience this is delicious! Take the time to make it. Need to access some file powder and shall happily makes this delight thinking back on visits to New Orleans . . . Beautifully plated besides . . . In the process of making this now. Looking forward to trying it. File powder was the hardest ingredient to find. Thank you specialty spice store. Grocery stores didn’t carry it.